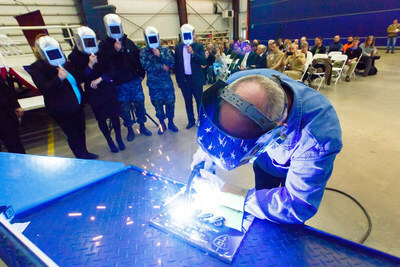 MARINETTE, Wis., Feb. 22, 2018 /PRNewswire/ — The Lockheed Martin (NYSE: LMT)-led industry team officially laid the keel for the U.S. Navy’s 21st Littoral Combat Ship (LCS), the future USS Minneapolis-Saint Paul, in a ceremony held at Fincantieri Marinette Marine in Marinette, Wisconsin. Ship sponsor Jodi Greene completed the time-honored tradition and authenticated the keel by welding her initials onto a steel plate that will be placed in the hull of the ship. The Lockheed Martin and Fincantieri Marinette Marine team is currently in full-rate production of the Freedom-variant of the LCS, and has delivered five ships to the U.S. Navy to date. The future USS Minneapolis-Saint Paul is one of eight ships in various stages of construction at Fincantieri Marinette Marine, with one more in long-lead production. LCS 21 will be the second vessel named for the Twin Cities. SSN-708, a Los Angeles-class submarine, served as the first USS Minneapolis-Saint Paul and was decommissioned in 2008. Her name honors the Twin Cities’ patriotic, hard-working citizens for their support of the military. The Freedom-variant LCS team is comprised of Lockheed Martin, shipbuilder Fincantieri Marinette Marine, naval architect Gibbs & Cox and more than 800 suppliers in 42 states. Founded in 1942, Fincantieri Marinette Marine (FMM) is located on the Menominee River flowage into Green Bay. The largest shipyard in the Midwest, FMM has delivered more than 1,300 vessels to the U.S. Navy, U.S. Coast Guard, and commercial customers, including the technologically advanced Littoral Combat Ship Freedom variant for the U.S. Navy. In 2008, FMM along with several sister shipyards also based in the Great Lakes region, became part of Fincantieri, one of the world’s largest shipbuilding groups and number one by diversification and innovation, with more than 19,400 employees, of whom more than 8,200 in Italy, 20 shipyards in 4 continents. Fincantieri operates in the United States through its subsidiary Fincantieri Marine Group, serving both civilian and government customers. Over the past five years, Fincantieri invested more than $100 million in both capital infrastructure and its resources to support FMM’s transformation into what is now one of the best shipyards in the United States. Employing approximately 1,500 employees, today FMM is a state-of-the-art, full service new construction shipyard. Gibbs & Cox, the nation’s leading independent maritime solutions firm specializing in naval architecture, marine engineering and design, is headquartered in Arlington, Virginia. The company, founded in 1929, has provided designs for nearly 80 percent of the current U.S. Navy surface combatant fleet; approaching 7,000 naval and commercial ships have been built to Gibbs & Cox designs.